Small and tucked in a mini strip mall off Hwy #116 right by the #101 freeway off-ramp and just before entering Cotati, this place is a little jewel of a find and the owner, Ding (pronounced Dee) couldn’t be nicer. Who’s Lynn? Ding’s aunt who has returned to Thailand. Lucky for us Ding stayed here! She tells me she gets very few Cotatians? Open for three years, Cotati does not know what they have been missing because this place is definitely worth a visit. Especially for the lunch specials! Served with two vegetable rolls to start and either a cup of excellent coconut soup or a salad, white or brown rice included. All for $8.95 – $9.95, this is a deal. On my first visit I ordered one of the lunch specials, Vermicelli Noodles ($8.95 ****). Really flavorful and a good-sized portion; and a glass of iced Sweet Thai Tea ($2.50****) to wash everything down. On my second visit, again for lunch, I ordered off the regular menu. First, Salt & Pepper Calamari ($8.95 ***) very tender bodies breaded lightly with Panko crumbs then fried quickly and served with a sweet chili sauce. Wonderful. Next, Papaya Salad ($7.95****) fresh papaya, carrot, tomatoes mixed with ground peanut lime sauce. I love this salad and Lynn’s makes a good one. For dessert, Black or White Sticky Rice with fresh Mango slices ($5 ****) very few Thai restaurants serve the black rice as it is more expensive and hard to find but, oh so good. Third visit: Dinner, we ordered Crab Rolls ($9.25***) six fresh rolls with crab meat and filled with julienned carrots, Thai basil and Enokitake or, enoki mushrooms (long, very thin and white) served with sweet and sour lime sauce; Tom Yum ($8.25***) hot sour soup, with lemongrass, galangal, kefir lime leaf, onion, tomatoes and mushrooms; Barbeque Chicken ($8.95***) grilled chicken served with sweet and sour plum sauce; and, Pad Thai ($8.25****) pan-fried rice noodles, ground peanut, egg, green onion, tofu and bean sprouts. For $2 more I added prawns to my Pad Thai. Everything was good and I especially liked the rolls, so light and crunchy and the Pad Thai was very, very good. Tom Yum is an excellent soup with the subtle flavors of lemongrass and kefir lime. Like lunch, there is a separate sheet in the menu with “Dinner Specials” priced from $8.95 – $9.95 with a selection of 6 – 8 items, all ala carte but, good value. 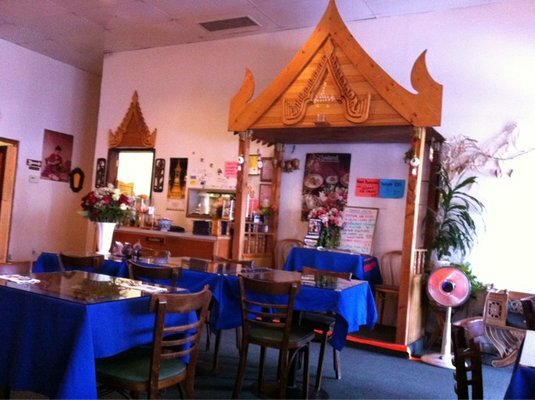 My advice: Get Thee to Lynn’s Thai Restaurant in Cotati and enjoy authentic Thai cuisine at reasonable prices.